Monitor Audio unveils all-new sixth generation Silver series | What Hi-Fi? The nine-model range features two standmounters, three floorstanders, two new centre channels, a surround speaker and an active subwoofer. Monitor Audio revealed its new Silver series of speakers - now in its sixth incarnation - at the Munich High End Show 2017, with nearly every aspect of the speakers redesigned. The visual flourish of the speckled tweeter grille gives the speakers an eye-catching look, too. All Silver speakers (apart from the subwoofer, naturally) feature this new 25mm gold dome tweeter. The company's other proprietary technology - C-CAM (ceramic-coated aluminium/magnesium) material mid-bass drivers - also features across all Silver models. Certain technologies from the company's flagship Platinum II Series have trickled down to this latest Silver range. This includes a DCF coupling mechanism, designed to improve the roll-off in the high frequencies of the drivers as well as minimising distortion. Monitor Audio enlisted the help of the National Physical Laboratory (based in Teddington) to design the handcrafted cabinets. A precision laser scanner from the NPL was used to identify cabinet resonances, and then help position internal bracings more accurately to ensure rigidity and minimise any colorations. All models have a slimline build designed for 'modern living', with HiVe II ports positioned at the back and slim magnetic grilles for a neater, elegant look. 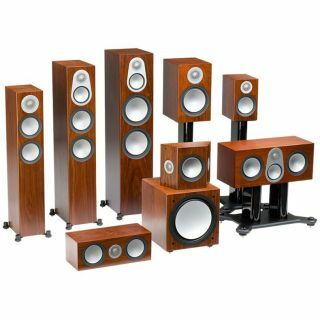 All speakers are available in a variety of finishes: a new satin white, high gloss black (for an additional cost), and wood veneers in black oak, natural oak, rosenut and walnut. The Silver series will be available from July.